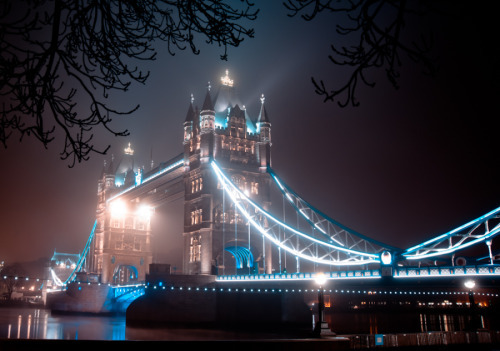 The United Kingdom has some of the most recognizable architecture on earth. We’re all familiar with British cities full of history and character; the sites and subjects of great literature and films. It’s a challenge for the artist to look at these towns and their landmarks in a new way, in a way that doesn’t echo the postcards tourists have been carrying home for years. For many artists who live in these cities, the aim is to portray a well-known landscape as their own personal space, as their home. Others see these ancient cities through the lens of the modern world: colorful, electric, chaotic. Using a variety of mediums, artists have found fascinating methods for representing notable cityscapes in a new and unexpected light. Roger Aslin draws inspiration from his career in the music industry, as well as his fascination with film and television to create arresting and dynamic paintings and photographs. He employs a highly defined palette, which reduces the image to key elements in order to “distill the essence of each subject he examines.” In his Urban Series, he portrays people in London going about their daily lives. He shows people sunbathing on the roofs of buildings, or stepping outside for a break. The people frequently provide flashes of warm color against a strikingly cool background of buildings and streets. In “Break,” we see a lone figure in an orange shirt looking out over a pile of buildings and staircases. The heightened effect of sunlight and shadow makes each painting feel like the memory of a moment, and reminds us that it’s people working and playing and living that gives life to the buildings of a city. Sam Aylwin uses layers of color and light to create cityscapes that are cluttered and full of life. The colors are hyper-real or even surreal, and the whole picture seems to be moving, giving the impression of a frenetic urban existence. We almost feel that we can see the energy pouring off the people, cars and buildings. Fellow artist Bob Heath describes the way that Alywin “transforms the mundane subject into poetic expressions of how it feels to have been there to witness that space.” She allows us to see the invisible busyness of the city. 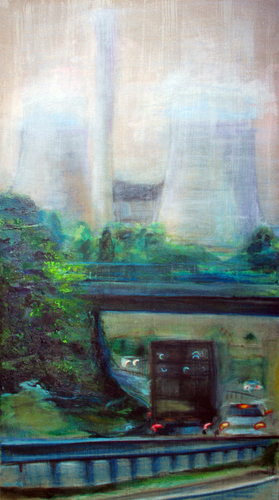 “Road to Work” is a painting that finds beauty in the commute to work. We have light and motion as well as a sort of contemplative silence that transforms a potentially unpleasant subject into a memorably beautiful scene. 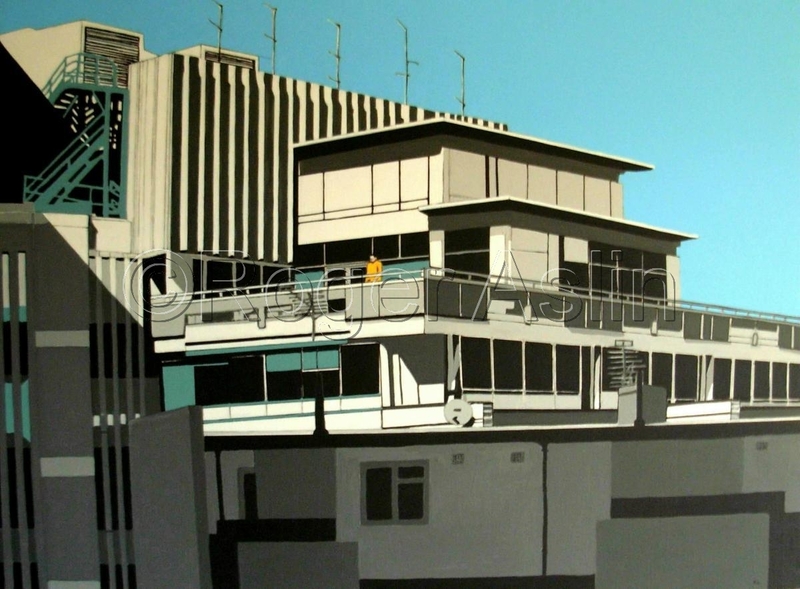 Bob Heath, himself, uses “collage elements and abstraction to enliven the surface.” He listens to John Coltrane, Miles Davis and Wayne Shorter, and his paintings are full of the joyful noise of jazz music, coming in and out of focus, finding sense in the visual noise of the modern urban world. 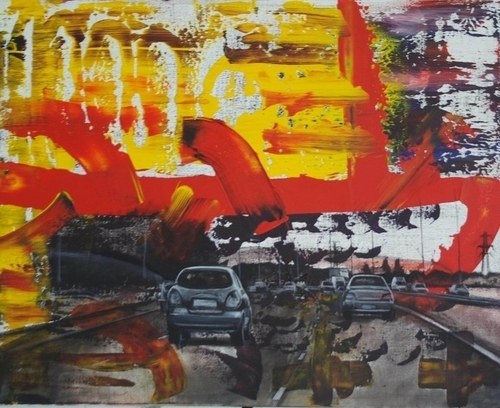 His painting “Motion,” a work of contemporary realism, shows a procession of grey cars on a dreary road, driving into a sky full of bright warm slashes of color, full of patterns that make a strange sort of sense. We feel the movement of the cars and we’re drawn to make stories about the drivers and to try to understand what they’re thinking and where they’re going. Hubert Omanski’s photography transforms well-known London landmarks into scenes from an unearthly amusement park. He doesn’t use photography to capture reality as we all see it, but to show us a world as it could be, full of uncommon light and life. He quotes surrealist photographer David LaChapelle as saying “If you want reality take a bus,” and certainly Omanski’s photographs, though grounded in a reality we all recognize, take it to a wonderful new place. In his hands, the lights of the city, through clouds and fog and reflected in the rain, are otherworldly and striking. In "Tower Bridge," he shows the renowned structure as we have never seen it, in haunting cool blues and warm pale shades of rose. In daily life we experience a city as a cold, monumental heap of buildings and bridges, streets and stations. The human activity that takes place in this landscape is the breath that keeps it alive and at work. In painting, photography, and collage, a collection of artists have helped us to see the spirits that pour forth from any urban environment. We sense the energy and warmth of the people that move through the city, and we’re compelled to travel with them.